These arteries are on the medullocortical junction, where they create a vascular cap above the convex side of the bases of the pyramids. While altogether staying in the similar arcuate plane alongside the surface of the kidney, they subdivide within various sections. These divisions are often referred to as “subarcuate arteries“. 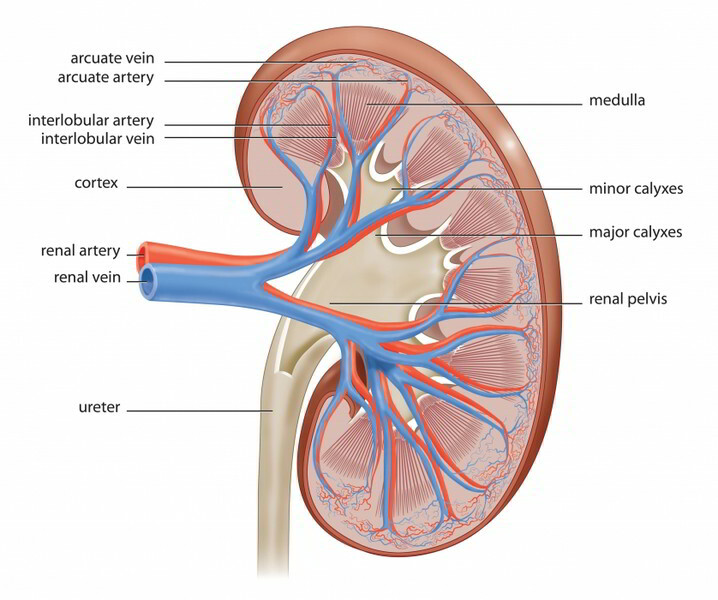 Via the convex part of an arcuate artery along with its divisions there originates the interlobular arteries that goes towards the kidney’s surface. The arcuate artery along with its divisions eventually decrease in abilities, and afterwards its greatest divisions move sharply upwards in order to permeate the cortex, in a manner similar to the interlobular arteries. Irregular small complex branching vessels totally circulated over the parent trunk vasa vasorum. Small vessels of different length which exit at a relatively sharp angle, primarily via the concave surface of the arcuate artery. Each of these vessels terminates within single or numerous juxtamedullary glomeruli, becoming their afferent arterioles. The third type is rarer. It looks like small vessels, but it does not seem to go towards a glomerulus. Rather, it gets thickened in an unspecific manner just, proximal towards its subsidiary within straight medullary branches. Branches moving towards the pelvic, wall along with surrounding connective tissue. They terminate in the medulla after having gone under the calyceal recess. A segmental artery branches inside the renal sinus, producing several interlobar arteries. An interlobar artery perforates the parenchyma within the pyramid surface along with a column of Bertin and creates a splay of six to eight arcuate arteries. The arcuate arteries arc around the corticomedullary junction and go upwards to the lateral side of the pyramid and also above its basal surface in order to complete at the middle of a renal lobe. Because the arcuate arteries do not anastomose, the central part of the renal lobe is most prone towards ischemic injury. At vertical or somewhat tilted angles, interlobular arteries (cortical radiating arteries) emerge out of an arcuate artery and also may divide as they travel through the cortex toward the renal capsule.